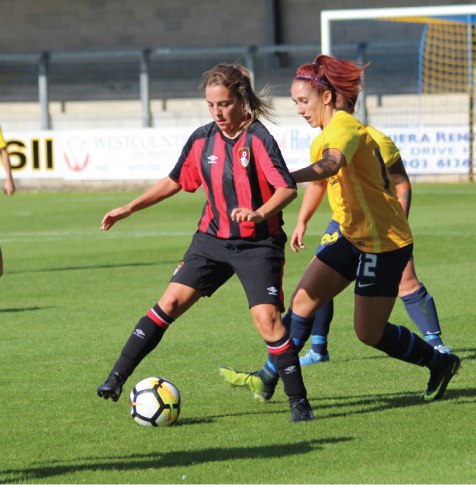 Women footballers from AFC Bournemouth will be able to make the most of their talents thanks to a new partnership between the Club and Brockenhurst College. The initiative is part of AFC Bournemouth’s new Female Elite Player Programme, which aims to nurture footballing ability while helping players develop new knowledge and skills. Women on the scheme will study, train and play at the College in the New Forest, which also taught Wales and Burnley striker Sam Vokes, who began his career at Bournemouth. The players will train every day at Brock and represent AFC Bournemouth in weekly fixtures. They will also study the College’s BTEC Level 3 Diploma in Sport or a variety of A Levels, starting in the new 2018/19 academic year. In addition, they will benefit from Brock’s extensive sporting facilities, which include 25 acres of playing fields and a floodlit, full-size artificial turf pitch. Another benefit for the players is Brock’s Sports Academy system, which often has footballers selected to represent Great Britain Colleges. Head of Community at AFC Bournemouth, Steve Cuss, said: “The programme offers an opportunity for talented aspiring footballers to study full-time whilst representing the Club on a weekly basis. “The programme will allow players to play for their current Clubs, although given our engagement with players we would hope that many will progress into our existing Ladies teams, and we expect many students to come through our current female Youth teams. Meanwhile, Brockenhurst College’s Head of Curriculum for Sport, Clare Hicks, said: “We are delighted to be involved in this programme and are excited to offer these up-and-coming women footballers an excellent education alongside their Club football provision. “Having played football as a junior myself, I can safely say I would have loved to have been a part of a programme like this one,” she added. An open evening for budding female footballers will be held at AFC Bournemouth on Monday 23 April from 6.30pm, with trials due to take place on Saturday 5 May (10am – 12noon) and Monday 14 May 2018 (6.30pm – 8pm). To register your interest or for further information, please contact Andrew Battison, Senior Manager at AFC Bournemouth Community Sports Trust, via andrew.battison@afcb.co.uk or 07887 384762.